Never drill off-center holes again...use our Center Finder to quickly and easily position your drill press chuck directly above the exact center of a round workpiece. 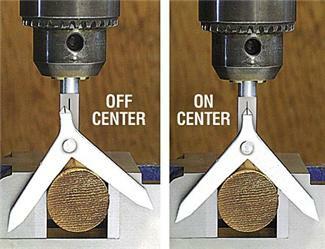 Indicator amplifies the slightest misalignment so you can adjust before drilling. 3/8 inch shank fits larger drill presses. Click the button below to add the Center Finder for Round Stock to your wish list.